I have chosen three of the best ten of June games, which, as far as I know, have not been commented in Russian-language press. Now I offer them to your attention in order of growing admiration of the judge. The collection evokes associations with Russian fairy tales. In one game, White attacked at the queenside, in the second one – at the kingside, and in the third one, naturally, in the centre. Each time an attack was accompanied by a loss of a knight ("horse" in Russian) with a rich reward in the end. In the rear of the top ten in June there was the victory by Vasilios Kotronias over Arkadij Naiditsch where White sacrificed on f5 in Ruy Lopez. Usually this method is connected with opening of the g-file, but White had no time to play g2-g4 in the given game and had to use other files and diagonals for the attack. 1.e4 e5 2.¤f3 ¤c6 3.Ґb5 a6 4.Ґa4 ¤f6 5.0–0 Ґe7 6.¦e1 b5 7.Ґb3 d6 8.c3 0–0 9.h3 Ґb7 10.d4 ¦e8 11.¤g5 ¦f8 12.¤f3 ¦e8 13.¤bd2 Ґf8 14.a4 ¤a5. To employ the system with 14...h6 one needs to have big courage and tenacious memory. This concerns the text move in lesser degree still. 15.Ґc2. 15.Ґa2 occurred also. Volokitin – Morozevich, Biel 2006, entered our orbit once: 15...exd4 16.cxd4 c5. 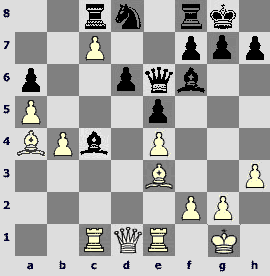 Belyavsky defended immediate 15...c5. 15...b4. 15...c5 was tested here also at first, but then Morozevich (Grischuk – Morozevich, Monte Carlo 2006) pushed forward the neighbour pawn thus having started rapid developing of the alternative line. 16.d5. In Ivanchuk – Miton, Dagomys 2007, White got the upper hand after 16.Ґd3 bxc3 17.bxc3 d5 18.exd5 exd4 19.¦xe8 Јxe8 20.c4 c6 21.¤b3! Computer recommends 18...Јxd5!, but the idea seems hardly be tested in practice, as most recently in the last round in Montreal Sutovsky (against Miton again) employed a new continuation 18.Јc2! dxe4 19.¤xe4 ¤xe4 20.¦xe4 with serious troubles for Black. 16...bxc3 17.bxc3 c6 18.c4 Јc7. Something like tabia. The play in this position is not of a forced character and there is large room for strategic thought. 19.Ґa3. In the primary source 19.Ґd3 ¦eb8 20.Ґa3 Ґc8 21.Ґf1 Ґd7 22.¦e3 c5 23.Јc2 g6 occurred with a good play for Black. In Wang Hao – Jakovenko, Taiyuan 2006, Black saved the c5 square fore his knight: 19...Ґc8 20.¤f1 ¦b8 21.¦a3 ¤b7 22.Ґg5 ¤d7 23.¤e3 h6 24.Ґh4 ¤bc5 25.Ґc2 a5. Though the Chinese chessplayer won after long struggling, he was impressed by Dmitry's idea, and a year later (Cheparinov – Wang Hao, Taiyuan 2007) tested another modification: 19...¦eb8 20.¤f1 Ґc8 21.¦a3 ¤d7 22.¤e3 ¤c5 23.Ґc2 Ґd7 24.Ґd2 Јd8 25.Ґc3 ¦b7. We can see that unlike Jakovenko, Wang Hao left himself a suspicious knight on a5, but White cannot disturb it seriously. 19...¦eb8. I should mention a short duel Stefansson – Lobzhanidze, Luxembourg 2007: 19...Ґc8 20.¤h2 Ґd7 21.¤hf1 ¦ab8 22.¤e3 ¦ec8 23.Ґd3, draw. Kotronias will also transfer his king's knight to e3, not his queen's one. 20.¤h2. The last theoretic reference: D.Kononenko – Kravtsiv, Lvov 2007, – 20.¦c1 c5 21.¦b1 Ґc8 22.Ґb2 Ґe7 23.Ґc3 Ґd8 24.ўh2 ¦xb1 25.Ґxb1 ¦b8 with approximately even play. 20...Ґc8 21.¦c1. Immediate 21.¤hf1 is possible too. 21...g6. Let us call this plan an ambitious one. Black reserves the c5 square for his knight and plans to use his bishop on h6 in an occasion. 22.Јf3 ¤d7 23.¤g4 h5. Following the plan. Cautious 23...Ґg7 still allowed to avoid weakening of the kingside. 24.¤e3 Ґh6. Ambition to the end! Still 24...¤c5 was better. In the case of 25.dxc6 ¤xc6 26.¤d5 Јd8 White first puts his knight on the commanding height in the centre, however, he cannot prevent his opponent from doing the same. 25.¦cd1. Kotronias does not use Black's inaccuracy. He could obtain advantage by 25.dxc6 Ґxe3 (in the case of 25...¤xc6 26.¤b3 White controls the d4 point) 26.Јxe3 (but not 26.cxd7? Ґxd2) 26...¤xc6 27.¤f3 ¤b4 (27...¤a5 is also insufficient for equality due to counter attack 28.¦ed1, and bad is 28...¤xc4? 29.Јc3 with a fatal pin), and here White blows up his opponent's fortifications by means of 28.c5! ¤xc5 (clearly worse is 28...Јxc5 29.Јh6 or 28...dxc5 29.Ґb3) 29.¤xe5! dxe5 30.Ґb1. White regains a piece, his bishops being stronger in an open position. 25...¤c5 26.ўh1!? Black protected all the possible invasion squares at the queenside, and White launches an attacking action on the opposite wing. 26...Ґd7 27.¦g1 ўg7?! Najditsch is too ambitious. He prepares transfer of his rook to the h-file in the case of g2-g4, however, now Kotronias has a stronger idea. 27...Јd8 is more cautious, and if 28.g4 then 28...Јh4. Complications after 29.¤g2 hxg4 30.¤xh4 gxf3 31.¤xg6 fxg6 32.¦xg6+ ўh7 33.¦xd6 Ґxd2 are in favour of Black. 28.¤f5+! gxf5? Black still had time to change his mind and to show meekness. The best way put was to reject large material acquisitions: 28...Ґxf5 29.exf5 Ґxd2, saving pawn cover of the king. Further, 30.Ґxc5 is possible (in the case of apparently dangerous 30.f6+ it is too early to speak of checkmating also) 30...¤xc4 (worse is 30...dxc5 31.¦xd2 ¤xc4 32.¦e2), and after both tempting 31.fxg6!? and more restrained 31.Ґd3 there is much play ahead. 29.exf5 ¦h8. 29...Ґxd2? 30.f6+ leads to a rout. After 29...f6 30.Ґxc5 White obtains a strong attack, for example 30...dxc5 31.d6 Јd8 (in the case of 31...Јxd6 32.¤b3 White regains a piece) 32.¤e4 or 30...Ґxd2 31.¦xd2 dxc5 (on the cunning computer move 31...Ґe8!? strong is straightforward 32.g4) 32.Јxh5 Ґe8 33.Јh4. 30.Ґxc5 dxc5 31.d6 Јd8 32.¤e4. White forces interact in harmony. 32...Јh4. On 32...¤xc4 would follow 33.Јc3. 33.Јc3. The move looks good here too. Though 33.¤xc5 is probably stronger, since Black could obtain a possibility to hold defence as the result of the half-forced variation occurred in the game. However, some resources for Black after 33.¤xc5 can be found possibly in detailed analysis. 33...Ґxf5 34.Јxe5+ ўg6. His Majesty has to put himself under roentgen. 35.d7! ¤xc4 36.Јxc5 Ґxe4 37.Јxc6+ ўg7. A brave march to the centre would be disastrous for the king's health: 37...ўf5 38.¦d5+ (in the case of 38.f3 Ґxc2 39.g4+ hxg4 40.fxg4+ ўg5 41.¦d5+ Black escapes by 41...¤e5! 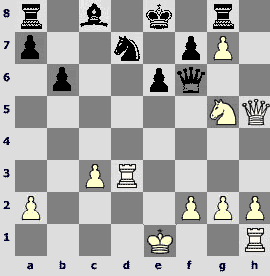 42.¦xe5+ ўf4, and the white rook is under attack – no mate!) 38...¤e5 39.Јc3 Ґg7 40.¦e1! 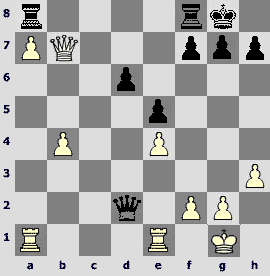 (a picturesque position) 40...Ґxc2 41.Јxc2+ ўe6 42.¦e4, and Black cannot stand. 38.Ґxe4 ¤e5 39.Јc3!? [39.Јd5 ¤xd7!] 39...Јxe4 40.¦ge1 Јg6 41.¦xe5 ўh7. Immediately loses 41...Јf6 42.¦d6! 42.Јf3. There is a mistake in the "official" text of the game (41.¦d5, and then as in our text, which is absurd), and I am not sure that Black resigned just now. Objectively, his position is not very joyful: the passed pawn d7 irritates much, few own pawns left, the king is not under good cover when all major pieces are on the board... Having no full information, we state: 1-0. The following game is on the ninth place, where Julio Granda seems to have become a victim of opening ignorance. A method of reaching victory demonstrated by Rustam Kasimdzhanov combines energy and elegance. 1.d4 ¤f6 2.c4 e6 3.¤c3 d5 4.¤f3 dxc4 5.e4 Ґb4 6.Ґg5 c5 7.e5 h6. The alternative continuation 7...cxd4 has more than 70 years of testing. 10.Јc2. Black must play very attentively in the Vienna variation in general, besides, this line shows very bad statistics for him. White prepares moving his rook to d1 and thrusting to h7 with his queen. b) 15.Ґb5+ ўe7 16.¤d4 ¦xg7 17.¦ae1 ўf8 18.f4 a6 19.¦e5 ¤d7 20.Ґxd7 Ґxd7 Ftacnik – Levin, Bundesliga 2006. 11.Јh7 ўe7 12.¦d1. 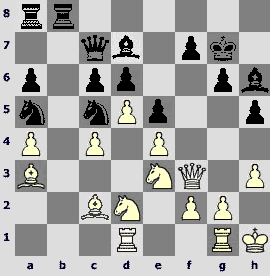 Van Wely – Najditsch, Bundesliga 2004, ended quickly and gracefully: 12.0–0–0 Ґxc3 13.bxc3 Јa5 14.Јxg8 Јxc3+ 15.ўb1 Јb4+ 16.ўc2 Јc3+, perpetual check. Strangely, White is better to keep his king in the centre and his knight pinned. 12...d3? Let us consider the move a decisive mistake till we have no any convincing proof presented that we are wrong. Tkachiev – Kharlov, Dagomys 2006, was short (I wonder why this scheme for Black is so popular just in team competitions where reliability is the main requirement?! ): 12...¤c6 13.Ґxc4 Ґd7 14.¤xd4 ¤xd4 15.¦xd4 Јa5? (Andrey seems to mix up or forget something: computer blames this continuation unconditionally) 16.0–0 Ґxc3 17.bxc3 Јe5 18.Јb1 Ґc6 19.¦e1 Јa5 20.Ґxe6 ўf6 21.Ґxf7 ўxf7 22.Јb3+ ўg6 23.¦e6+ ўh7 24.Јc2+, Black resigned. But 15...Јb6 is still waiting for refutation. 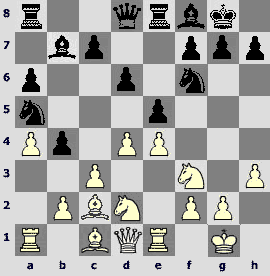 Khurtsidze – Zaiatz, Chisinau 2005: 16.Јe4 Ґc6 17.Јe5 Јc5 18.Јxc5+ Ґxc5 19.¦g4 draw, though Black could have thought for more in the final position. 13.Ґxd3! Defence of the d-pawn proved to be a myth. с) 14...Јe8 15.¤xg5 (worse is 15.0–0 Ґxc3 16.¦xc3 f6, and Black strengthens) 15...f6 16.¤ge4 ¤d7 17.0–0 Јf7 18.¦g3. Retaining his main argument, the g7 pawn, White obtains a serious advantage. 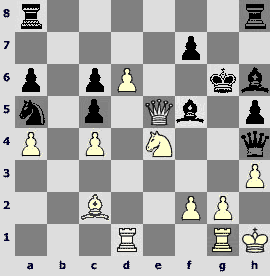 b) 16...f5 17.Јh4 Јg6 18.¤e4+ ўf7 19.¤d6+ ўxg7 20.Јe7+ 1-0, Moiseenko – Bluvshtein, Edmonton 2005. Beautiful mates occur in the case of 17...¦xg7 18.¤e4+ ўf8 19.Јh8+ ¦g8 20.Јf6+ Јf7 21.¦d8# or 17...¤d7 18.¤h7+ ўf7 19.Јh5+ ўe7 (19...ўxg7 20.¦g3+ ўh8 21.¤f6+! Јxh5 22.¦xg8#) 20.Јg5+ ўf7 21.¦xd7+! Јxd7 22.Јf6+ ўe8 23.Јf8+! ¦xf8 24.gxf8Ј#. 16.¤xg5 b6. After 16...Јe8 17.¤e4 there is no defence against ¤d6 and Јh4. 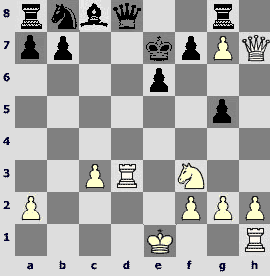 Kasimdzhanov puts an end to Black's try to develop by energetic play. 17.Јh4 ўe8. On 17...f6 decides 18.¤xe6! ўxe6 19.Јe4+ ўf7 20.Јd5+ ўe7, and now not 21.Јxa8 ¦xg7 with possibilities to resist, but 21.0–0! with an irresistible attack. 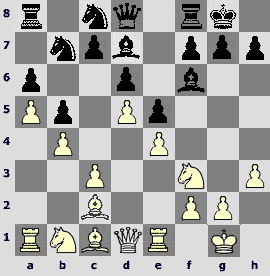 The king stuck in the centre meets troubles after 17...Ґa6 18.¦e3 (18.¤xe6+!? ўxe6 19.Јe4+ ўf6 20.Јf4+ ўxg7 21.¦g3+ ўf8 22.Јh6+ is probably not so convincing in view of 22...¦g7!) 18...e5 19.¤e4+ f6 20.f4 also. 18.Јh5! Hasty 18.Јh8? Јxg5 19.Јxg8+ ўe7 brings all the fruits to naught. 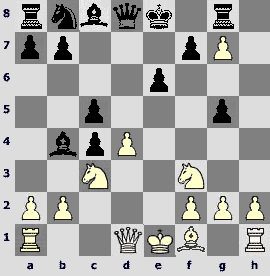 In the case of 18.0–0 Јf6 19.¦fd1 White retains his advantage but the text move is much stronger. 18...Јf6. The alternative is 18...Јe7 but White's advantage is of no doubt: 19.0–0 Ґa6 (19...Ґb7 20.Јh8 Јxg5 21.Јxg8+ ўe7 22.¦xd7+ ўxd7 23.Јxf7+ ўc6 24.h4 Јg4 25.h5, and soon White shall obtain a decisive material advantage; on 19...¦xg7 good is 20.¤xe6 Јxe6 21.Јh8+) 20.Јh8 ¦xh8 21.gxh8Ј+, and on any defence against the check White finds a way to give away exchange with profit – 21...Јf8 22.¦h3 Ґxf1 23.Јd4! or 21...¤f8 22.¤e4! Ґxd3 23.¤f6+ ўd8 24.¦d1. 19.¤xe6! Trainers get an excellent example of pinning for their card indices. 19...Јxe6+. Loses 19...Ґb7 20.¦e3. The most persistent is 19...ўe7 20.¤c7 Јxg7 21.¦g3 Јh8 22.Јxh8 ¦xh8 23.¤xa8, though giving away his knight for the b6 pawn White has all reasons to rely on his infantry power. 20.¦e3 Јxe3+ 21.fxe3 Ґa6 22.ўf2. More rigid is 22.Јh7! ўe7 (22...¤f6 23.Јf5ќ) 23.Јe4+ ўd6 (23...ўf6 24.c4 ўxg7 25.Јg4+) 24.h4ќ. 22...Ґc4 23.¦d1 Ґe6. It was worth to capture a pawn – 23...Ґxa2 as there is no direct punishment for the greediness. 24.Јh6 f6. After 24...ўe7 not very good looks 25.g4 ¤f6 26.h3 ¤e8. Stronger is 25.¦d4! with exemplary 25...¤f6 26.Јg5 ¦xg7 27.Јxg7 ¦g8 28.Јh6, and White can not lose his queen on a double attack. 25.g4 ўf7 26.g5 fxg5. In the case of 26...¦xg7 27.¦xd7+ Ґxd7 28.gxf6 ¦gg8 29.Јh7+ ўxf6 30.Јxd7 white pawns are dispersed but numerous, and Black can hardly activate his a8 rook without losing the a7 pawn. 27.ўg1 ¦ae8?! Granda seems to submit his loss: he does not take enemy pawns and gives away his own ones. 27...g4 is more stubborn. 28.¦f1+ ўe7 29.Јxg5+ ўd6 30.¦d1+ ўc6 31.h4 ¤c5 32.ўh2. Avoiding even the slightest complications that could arise after 32.h5 ¦xg7 33.Јxg7 ¦g8ќ. 32...¤e4 33.Јg6 ¤f2 34.Јg2+. Black resigned. In conclusion, the second prize winner. Smart manoeuvres on the queenside by Alexander Morozevich will comment his old friend and assistant Vladimir Barskij (ChessToday), and I say good bye to you and proceed to looking through July games. 1.e4 e5 2.¤f3 ¤c6 3.Ґb5 a6 4.Ґa4 ¤f6 5.0–0 Ґe7 6.¦e1 b5 7.Ґb3 d6 8.c3 0–0 9.h3 ¤d7 10.d4 Ґf6 11.d5. Continuations 11.a4 and 11.Ґe3 are more popular. Morozevich used to play both of them before but 11.d5 did not occur in his practice. 11...¤a5 12.Ґc2 ¤b6. Once Socko won the following game: 12...Ґe7 13.¤bd2 ¤b6 14.¤f1 Ґd7 15.¤e3 c6 16.dxc6 Ґxc6 17.¤f5 ¤b7 18.¤h2 ўh8 19.b3 ¦e8 20.¤xe7 Јxe7 21.¤g4 ¤c5 22.Ґa3 with mutual chances, Socko – Lugovoi, Moscow 2002. 13.a4. White chose 13.¤bd2 more frequently, for example 13...c6 14.dxc6 Јc7 15.¤f1 Јxc6 16.¤e3 ¤ac4 17.¤g4 Ґe7 18.b3 ¤a5 19.Ґa3 ¦e8 20.Јd2+= Vasiukov – Smyslov, Tbilisi 1966. 13...Ґd7!? 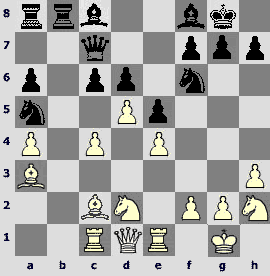 A novelty; earlier Black played 13...bxa4 or 13...Ґb7 in this rare position. 14.b4 ¤b7. In the case of 14...¤ac4 15.a5 ¤c8 16.Ґd3!? the knight on c4 is deprived of possibility to return to its camp. White can exchange it and then to win the pawn on c4. 16.c4!? A very interesting idea. Morozevich could prepare the move, but he prefers to sacrifice the pawn in order to get the c3 square for his knight. 16...¤a7. After 16...bxc4 White could change his mind and play 17.¤a3!? 17.¤c3 bxc4 18.Ґe3 ¤b5 19.¤xb5 Ґxb5. Certainly not 19...axb5?? 20.a6, and White wins a piece. 20...Јe8. But black is preparing it again. 22.¤xc4! A very interesting piece sacrifice! 22...Ґxc4 23.dxc6!? Computer stands for 23.Ґxc6 Јe7 24.Јc2 Ґb5 25.Ґxb5 axb5 26.a6 ¤d8, and the knight on d8 has no moves. However, Morozevich finds another very attractive idea. 23...¤d8 24.c7 Јe6. In the case of 24...¤c6 25.¦c1! Ґb5 26.Ґxb5 axb5 27.Јxd6 ¤d4 (27...¤e7 28.¦c5ќ) 28.Ґxd4 exd4 29.e5 Ґg5 30.¦c2± Black practically cannot stir. 26.Ґb6! 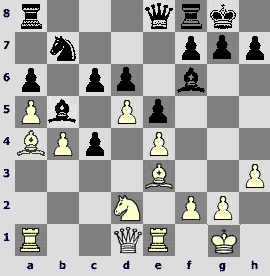 Morozevich does not make haste: Black is unable to save his knight. 26...Ґe7. Or 26...¤b7 27.Ґc6, and the knight has to return to d8. 27.Јc2 Ґb5 [27...d5 28.cxd8Ј ¦fxd8 29.Ґxd8 ¦xd8 30.Ґb3ќ] 28.Ґxb5 axb5 29.Јd3. White captures the b5 pawn and obtains a winning position. 29...Јh6 [29...¤b7 30.a6 ¤c5 31.bxc5 dxc5 32.Јxb5ќ] 30.cxd8Ј ¦fxd8 31.¦a1. Also strong is 31.¦xc8 ¦xc8 32.Јxb5ќ. White passed pawns are unstoppable, so Black resigned.